Kuehne + Nagel is one of the world’s leading logistics providers. The Kuehne + Nagel Group has some 1,300 offices in over 100 countries, with key business activities and market position built on the company’s truly world class capabilities in Seafreight, Airfreight, Overland/Road Freight, Contract Logistics, and Integrated Logistics. To ensure that all Kuehne + Nagel employees in North America had a consistent branded email signature, the Regional Marketing Team sought an email signature provider with a simple, yet customizable solution. Using consistent email signatures for its @kuehne-nagel.com email accounts is an opportunity to reinforce the company’s strong brand while relaying individuals’ contact information – and also create awareness about the company’s products, events, and initiatives, driving traffic to its U.S. Canada, and Mexico website pages. Provide a uniform email signature to about 7,000 employees in North America. Keep the program simple to use but provide customization to reliably meet the various marketing, legal & language requirements of over 100 locations in Canada, Mexico and the USA. Streamline the deployment of the signature across the enterprise (Office 365). An email signature program driven by user self-entered data coupled with the remote deployment of our Outlook Deployment Tool (desktop app). Kuehne + Nagel provided a PowerPoint presentation which illustrated the basic layout of the signatures they wanted (including 3 initial marketing banners they wanted included as an option). We converted their design to proper HTML (and TXT / RTF) files and loaded them into our online signature generation portal, setting up a half dozen Kuehne + Nagel locations in the process. This draft email signature program was provided to them for their internal review. Upon review Kuehne + Nagel determined that a scaled-down signature for use in replies was desired - we added that for them within 24 hours of their request. During the review-process they also informed us of a new requirement - the need to add a “Customer Thermometer” satisfaction survey to the signatures of certain users. They wanted to control the inclusion of the Customer Thermometer at an administrative level, rather than letting users self-select it. We did not have this capability in place at the time of the request, but offered to build it for them in a period of 4 weeks. 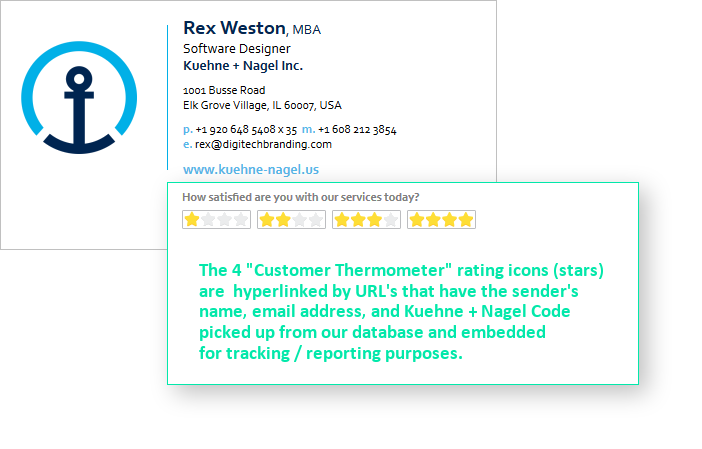 Upon discussion and analysis of the requirement we agreed to a concept whereby the Kuehne + Nagel administrator would upload “qualified” email addresses - meaning that anyone who’s email address had been uploaded would receive the Customer Thermometer in their email signature. We built this on schedule and provided it in an administrative interface that allowed Kuehne + Nagel to easily manage the list of qualified email addresses. However, before the launch, the requirement changed - Kuehne + Nagel now had to apply a particular Customer Thermometer to each qualified user and also had to add an internal Kuehne + Nagel Code to the database, to create the proper tracking of the satisfaction surveys. This was now a considerably more complicated data requirement, and so we needed to rethink the approach. Kuehne + Nagel still wanted no direct user access to setting up the Customer Thermometers, but now needed to make some specific user-based data assignments to make things work properly. We proposed, and then executed, another new feature - “hidden” fields. 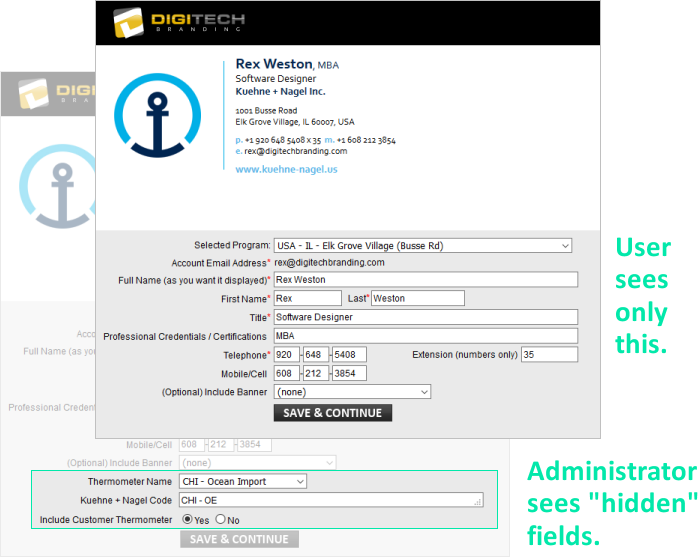 These fields were structured such that they were invisible to users as they filled out the data entry form, but when the Kuehne + Nagel administrator logged in via our administrative interface, they could see, and hence set them, for the user. With the “hidden field” approach in place, Kuehne + Nagel approved the project and sent us spreadsheets containing 204 locations in their North American Group. We promptly set up these locations finalizing the project on our end. In the meantime, Kuehne + Nagel IT staff tested our Outlook Deployment Tool and finalized their process for pushing it out across the enterprise (North America). In a coordinated effort between Kuehne + Nagel Marketing and IT, an internal employee communication announcing the email signature program was sent out at the same time that IT pushed out the desktop app. Users were instructed how to open the app, click “Edit Signature”, select their location, and fill out our online data entry form to complete their signature profile. In other words, to create their signature. Within the first 24 hours 2400+ users had created their signature, and this number rose to 3400+ after the first week. The expected total for USA users was about 4000, and a series of follow-on communications were planned to bring the final 600 or so on-board. With the bulk of the signatures created, the Kuehne + Nagel Customer Thermometer administrator set about activating the Customer Thermometer component of the signature for the subset of users needing it in their signature. This process proceeded seamlessly. Kuehne + Nagel personnel, Customer Thermometer personnel, and the DigiTechBRANDING team worked collaboratively over a period of a few months. The effort was neither trivial nor overwhelming. Together we made continuous, steady, progress that resulted in the North American deployment of a very well executed email signature program. 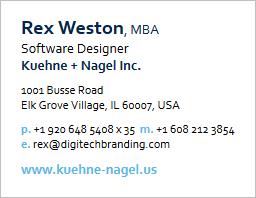 DigiTechBRANDING has a customer that we’re proud to support, and Kuehne + Nagel has the assurance of continued prompt attention to their program on an as-needed basis going forward.